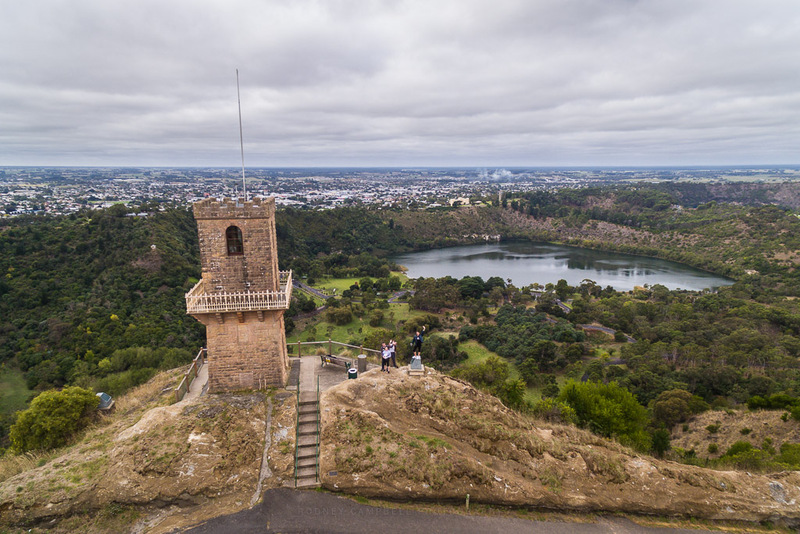 When visiting the Mount Gambier region, you should take a walk up to Centenary Tower to get the most scenic and panoramic views of Mount Gambier and the coast. The tower which opened to the public in 1904 is located 190 metres above sea level and provides the best views of the city, its beautiful countryside and the volcanic landscape. 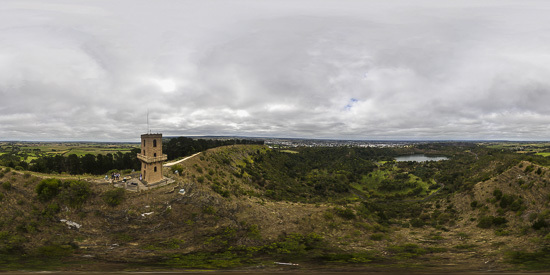 Another 360˚ interactive panorama taken with Dronepan and the DJI Phantom 4 flying just out from the Centenary Tower shows the fantastic views you can get from up here. 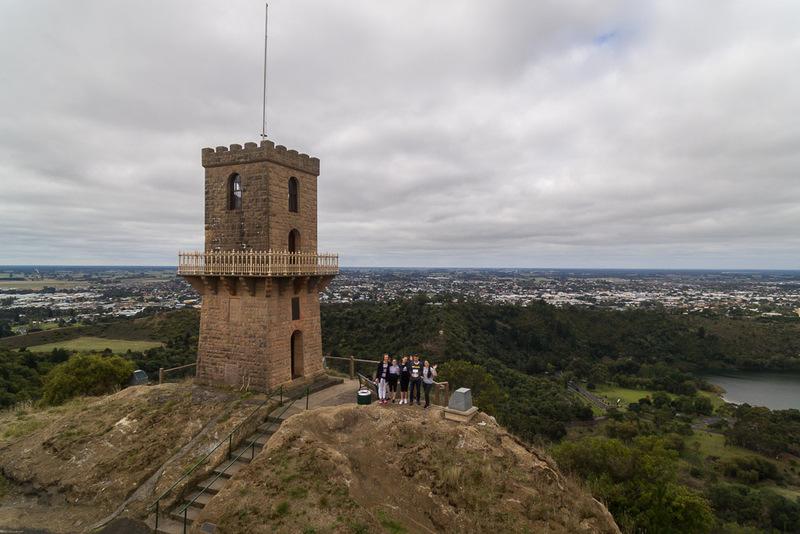 Unfortunately it was quite windy up here which meant the drone was moving up and down repositioning itself during the pano sequence which resulted in some near field stitching errors. The walk up here though not particularly long is quite steep so be prepared to be out of breath :). The view from up here at the tower across the Valley Lake towards Mount Gambier and the Blue Lake is quite spectacular. We were heading into town again today. 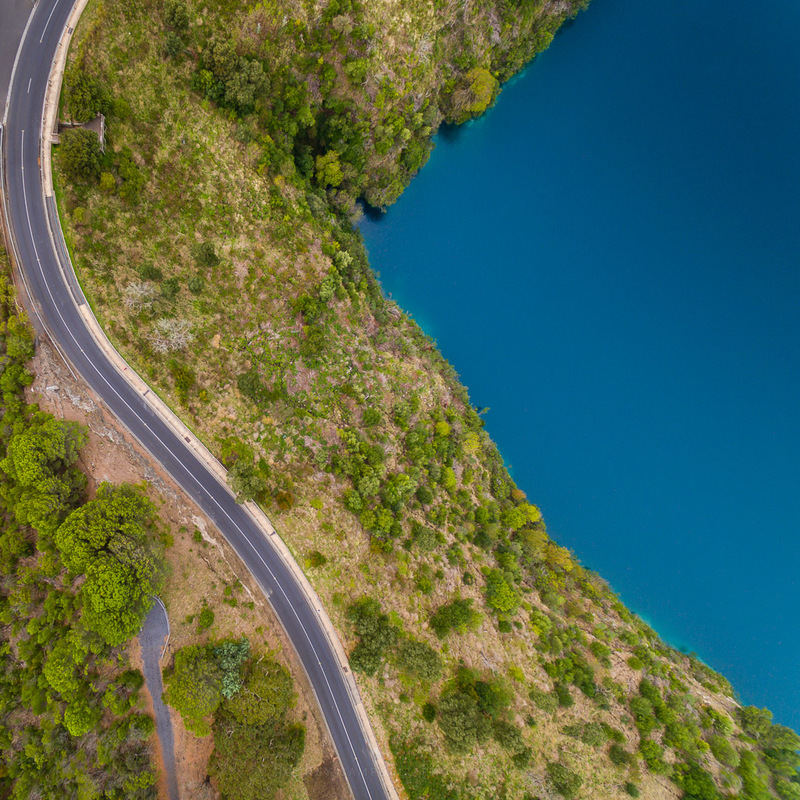 On the way we took a detour to Lake Leake to check it out and give the drone a run. Up first a 360˚ interactive panorama taken from high above the lake. I was using a new version of the Dronepan software which has now been improved for the Phantom 4. Firstly allowing the taking of an additional row of frames with the camera angled slightly upward to capture more of the sky. Secondly it allows the addition of a delay before taking the frames allowing the drone to stabilise a little more after rotating and moving the gimbal. 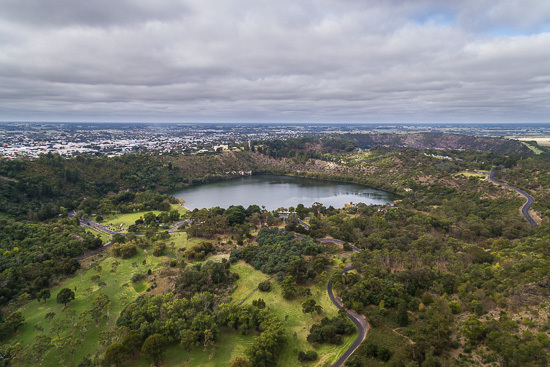 You can see that the lake is almost perfectly circular which leads me to surmise that this was once the mouth of some ancient volcano of sorts. 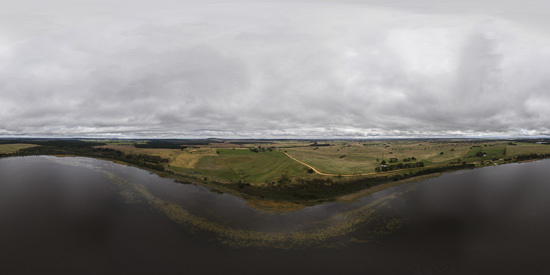 Below you have the flattened 2:1 aspect ratio equirectangular projection of the entire 360˚ (by 180˚) scene. We are all back in South Australia once again this year. 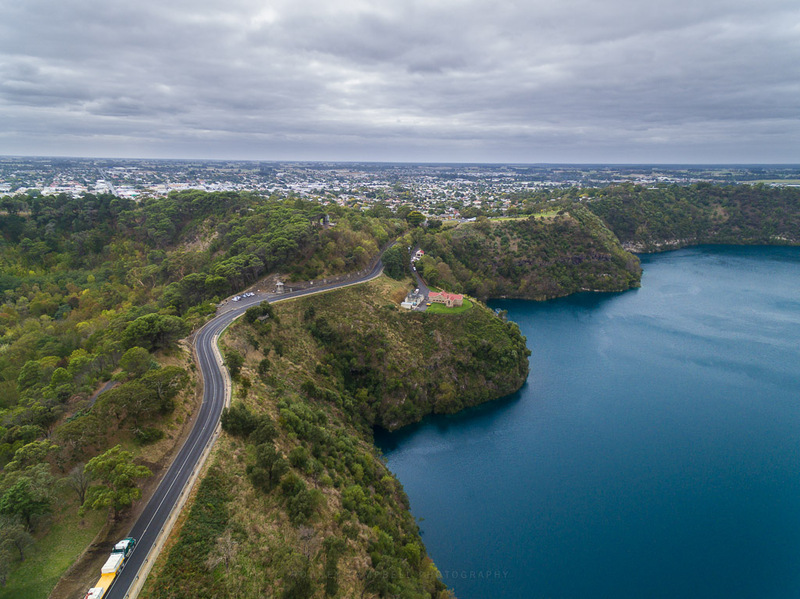 Visiting our relatives in the beautiful city of Mount Gambier over the Easter holidays. Instead of driving all the way there like we usually do we decided to fly all the way there this time. The upside was the much shorter trip (hours instead of days), however it did somewhat limit the amount of photography gear I could take :). 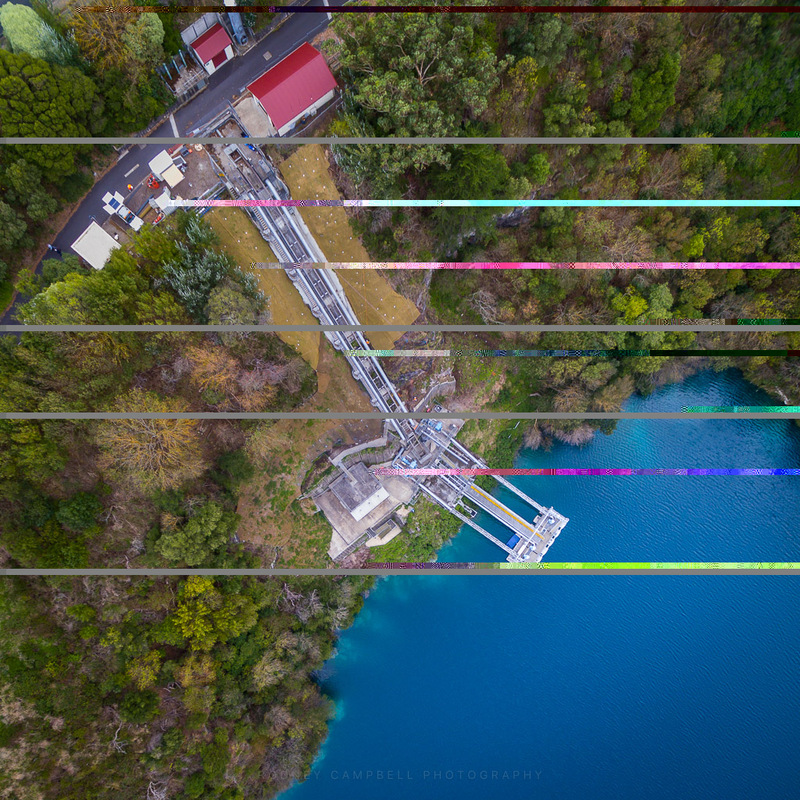 I decided to take just my drone backpack for this trip along with my Nikon D750 D-SLR and three lenses. Plus my usual landscaping filters and the tripod in my suitcase. 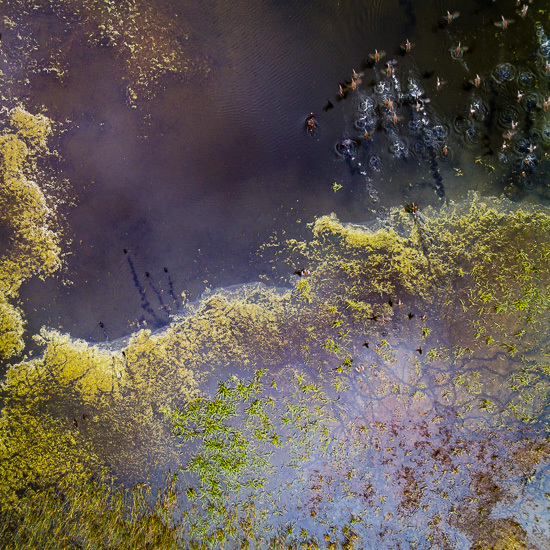 It was good to get out with the drone once again as I hadn’t flown it in months. 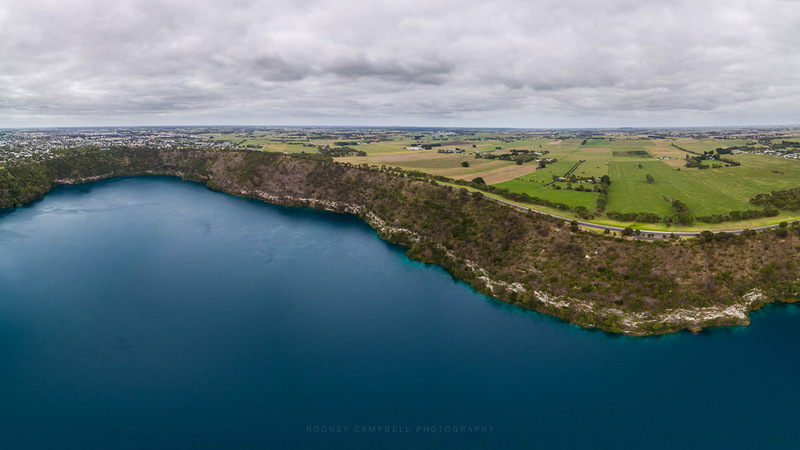 My sister in law and their family lives on a farm about 40 minutes from Mount Gambier so the opportunities to fly in open space are much more enticing. We had rain on and off for quite a few days, but inbetween with nice overcast skies there was some opportunity to fly. The old Blue Lake Pumping Station built in 1884, perches gracefully on a ledge 150 feet above the water level in the crater. As long as rain continues to fall on the aquifers of the county of Grey, as long as pollution can be kept within limits and provided always that the volcano remains asleep… The residents of Mount Gambier should be able to count on the eight thousand million gallons of rather hard but good quality water in their natural reservoir. I had originally intended on shooting a full 360˚ spherical panorama out in the middle of the lake – with the rim of the crater all around. Unfortunately for some reason the software I use to control the drone and take the images (Dronepan) mysteriously stopped part way through. So all I was left with was 16 usable frames (four columns of four rows). The resulting panorama still turned out rather nicely however. 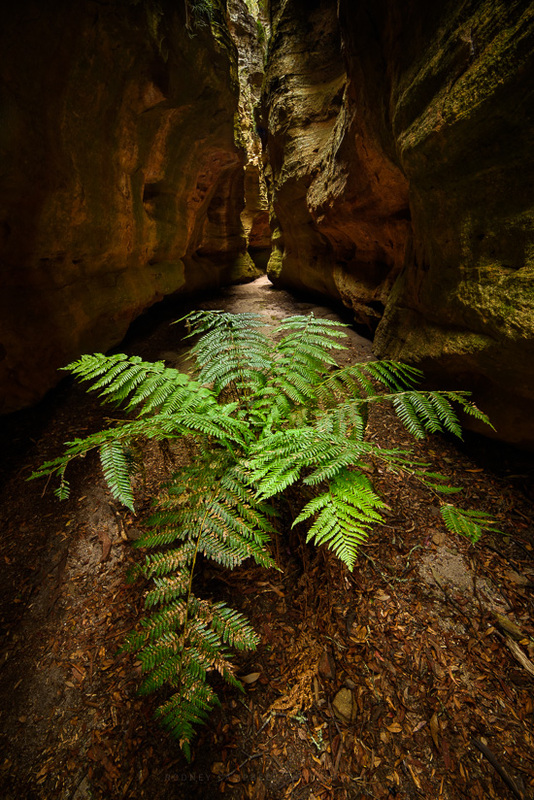 A single lone fern battles the elements of nature at the bottom of this Dry Canyon. A loner since the day it was born it lives here in solitude in a land that time forgot. It was setup perfectly for this shot – placed dead centre and all alone in this stretch of slot canyon. They call this region of the Central Tablelands of New South Wales, the Gardens of Stone National Park. Somewhat apt in this case I think. Thanks to Gerry for the quick loan of his camera & tripod to take the frames for this. I had unfortunately only brought my drone in here this afternoon and not my “real” camera. 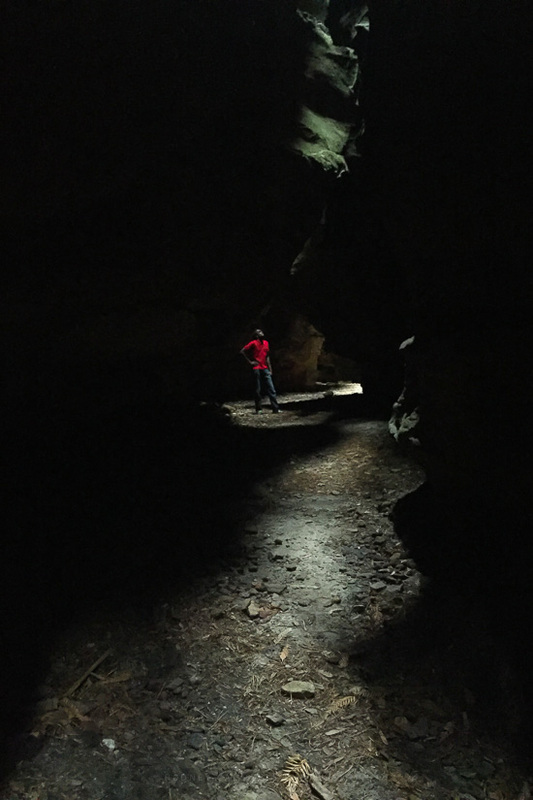 Well except I did manage to take this pretty epic shot of Suren in the canyon with my iPhone (something I would normally never do – shudder!!!). Maybe what they say is right – it isn’t the camera, it’s the photographer… nah… :). 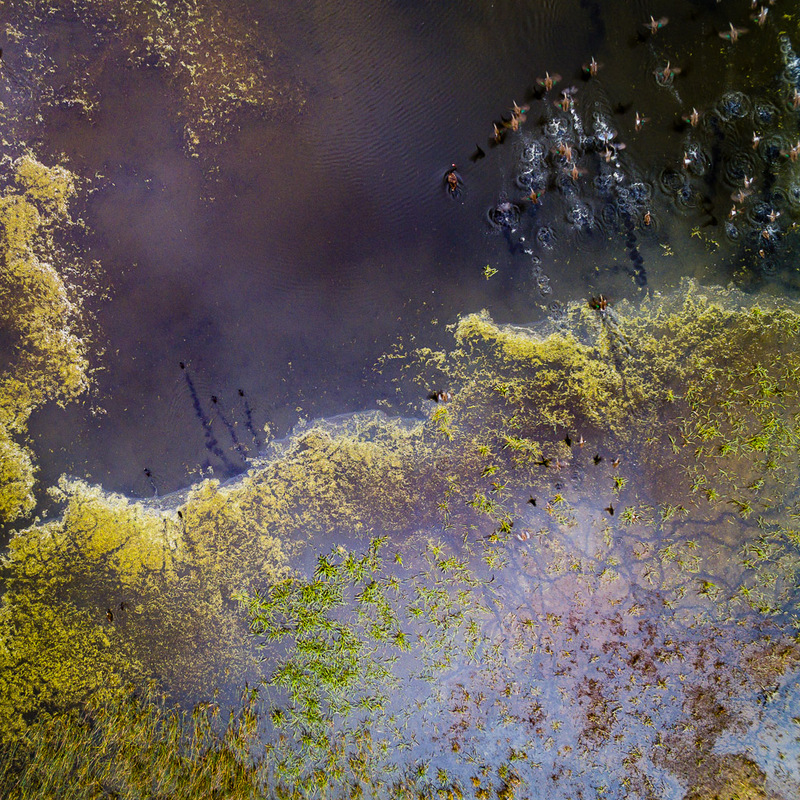 It’s lucky you only need to see this on a small screen – zoom in (even a little) and it’s just noise and smeared detail. So totally still need that D-SLR with it’s much larger sensor and “real” optics. Gerry had heard about this slot dry canyon way out in the wilderness near the Glow Worm Tunnel. This place is north of Lithgow near Newnes Plateau. Around 90 minutes drive on a terrible dirt road out to the middle of nowhere. Anyway Gerry knew roughly where it was but we weren’t really sure – and of course mobile reception didn’t work out here so we could even check on Google/Maps. 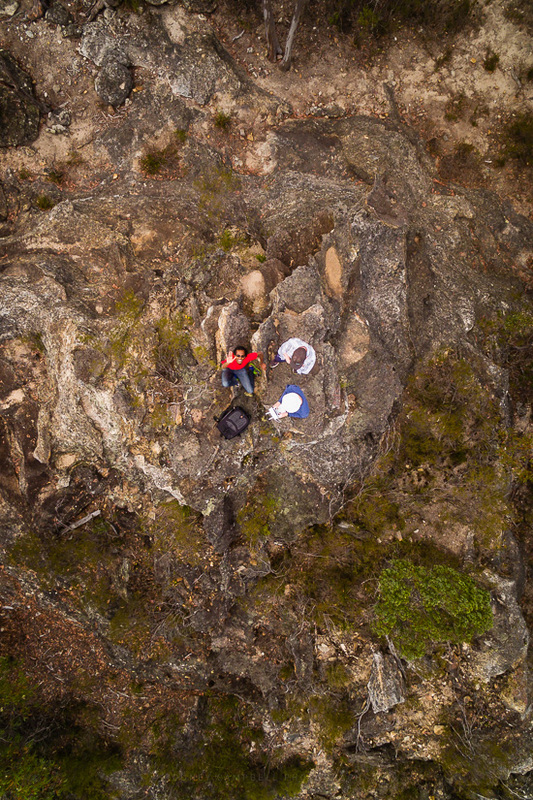 So I pulled out the drone, we climbed the nearest pinnacle of rock and took to flight. We recce’d the area where we thought it roughly was and found what looked to be the dry canyons. 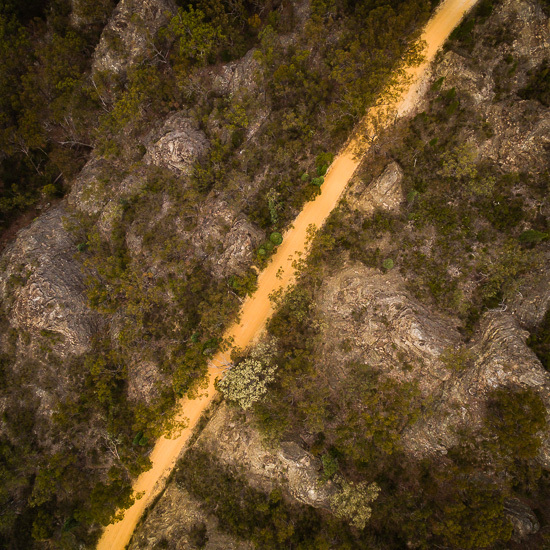 Our aerial recce done it was time to pack some gear and walk out into the wilderness in the direction of the canyons. 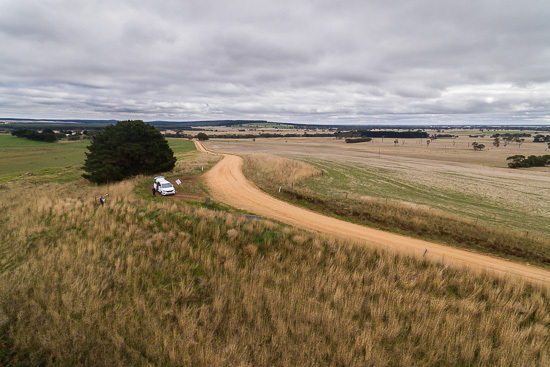 It was roughly 1km line of sight out to where I’d flown over so I packed fairly light. I took just my drone backpack with the drone itself. I unfortunately didn’t take my D-SLR and lenses or tripod (Gerry took some of his). As it turned out the dry canyon was pretty damn awesome (perhaps as close as we were going to get to those famous slot canyons in the desert of North America). 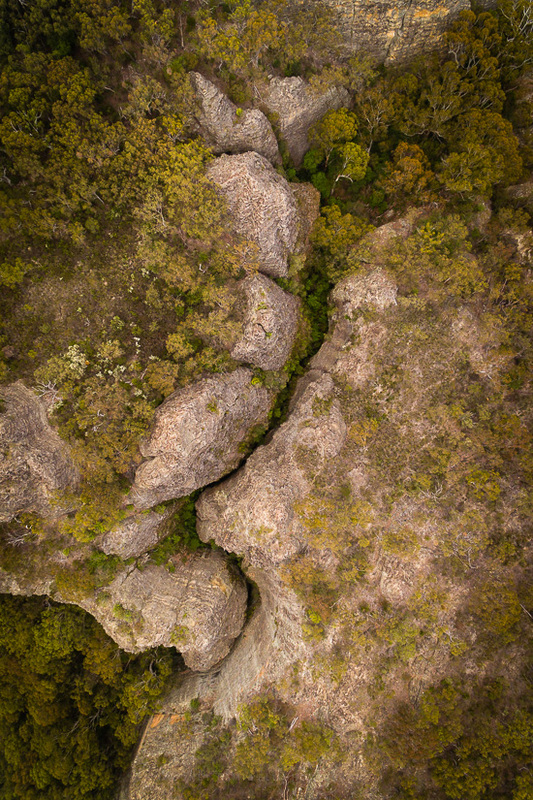 Gerry spent some time shooting there whilst I flew my drone through the canyons doing some video :). One day we’d like to return with our gear – not looking forward to the epic drive out there and back however!